Sea level rise could threaten the viability or existence of critical tidal wetland habitat. Changes in the timing of seasonal events such as migration and egg deposition could affect the reproductive success and survivorship of birds. Climate-related species range expansions/contractions could re-organize the structure of native bird communities. This summary highlights general avian responses to anticipated climate-related changes on the southern Oregon coast, citing specific examples where possible. Since virtually all birds are highly mobile and many are migratory, information about habitats and climate trends both inside and outside the project area are relevant. Due to the vast diversity of bird species on the southern Oregon coast and the variation of their life histories, a complete review of the anticipated effects of climate change for each species is beyond the scope of this project. For species-specific inquiries not directly addressed by this climate change summary, please refer to species distribution models such as the Audubon Climate Report (Audubon 2014b). Magnitude of local changes: The magnitude of climate-related change is likely to vary across the landscape. For example, the effects of sea level rise (SLR) depends on local tides, currents, storm patterns, rates of local tectonic uplift, and other elements that may dampen or amplify local SLR (Audubon 2014a). Migration: Since bird species are often migratory, they depend on a diverse chain of (sometimes distant) habitats for survival and reproduction (Audubon n.d.). Therefore, seemingly unrelated changes to climate in distant habitats may directly affect local bird populations. Adaptability: Audubon (2014a) explains that bird species’ responses to climate change may depend on individual species’ ability to colonize new areas/adapt to changing conditions. They add that the responses of the more highly mobile, adaptable species are particularly difficult to anticipate. Competition and Predation: The response of one bird species to changing climate conditions can affect other bird species’ populations. Audubon (2014a) suggests that climate-related variables may result in a redistribution of predators or competitors (including the shifting or expansion of non-native bird species ranges) that may prevent birds from successfully colonizing areas even if they are “climatically stable” (i.e., maintaining appropriate habitat conditions). To address these uncertainties researchers use various data analysis methods. For example, some perform “meta-analyses,” a robust compilation and analysis of data from multiple studies (Parmesan and Yohe 2003, Root and Hughes 2005 cited from World Wildlife Fund [WWF] 2006). Others use models to generate a suite of different climate change and avian response scenarios (e.g., bioclimatic models)(Audubon 2014b). Using these techniques, researchers have reached a general consensus that climate change is already affecting bird species behavior, distribution, and population dynamics across the globe (WWF 2006, Audubon 2014a, Parmesean and Yohe 2003). Changes in sea level, temperature, and precipitation have caused shifts in the timing of bird migrations and reproduction timing/success, as well as shifts in birds’ geographic distribution. Studies suggest that birds have modified their “phenology” (timing of important seasonal events such as migration and reproduction) in response to shifting climate variables (Rosenzweig et al. 2007, OCCRI 2010, Becker et al. 2007, Sydeman et al. 2009). For example, meta-analyses indicate that the timing of worldwide spring bird migrations occurred approximately 2-3 days earlier per decade (Parmesean and Yohe 2003, Root and Hughes 2005 cited from WWF 2006). However, phenology is changing much faster for certain species. For example, Root et al. 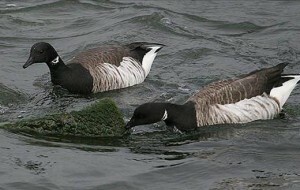 (2003) concluded that common murres (Uria aalge) in North America are migrating up to 24 days earlier per decade as the climate continues to change. A similar relationship exists between climate and the timing of egg deposition, with bird species generally advancing the time of egg laying as the climate warms (Hussell 2003; Dunn 2004). Shifts in phenology could affect the survivorship and reproductive success of bird species if they are unable to coordinate the timing of seasonal events with other important ecosystem processes (e.g., matching nestlings’ food demands with peak food supplies such as insects)(WWF 2006). Climate change may further limit reproduction in birds by modifying species abundance and availability of high quality breeding habitat. Research shows that waterfowl abundance in the northern Great Plains’ Prairie Pothole Region (PPR), which produces 50-80% of the continent’s breeding migrating duck population (Wong et al. 2012; WWF 2006), is correlated with climatic variables (e.g., soil moisture, precipitation, and temperature)(Podruzny et al. 2002; Bethke and Nudds 1995; Forcey et al. 2011; Sorenson et al. 1998). Even in the absence of precipitation changes, experts forecast that a marginal increase (~2.5° C) in average temperature from 1998 levels may reduce waterfowl habitat in the PPR by as much as 66% (Sorenson et al. 1998). The effects of climate on bird survival rates reaches beyond wetland breeding habitat for waterfowl. Bolger et al. (2005) found that drought in California corresponded to a 97% reduction in the reproductive success of four land bird species, including the wrentit (Chamaea fasciata), spotted towhee (Pipilo maculatus), California towhee (Pipilo crissalis), and rufous-crowned sparrow(Aimophila ruficeps), in semi-arid habitats. They anticipate these species are particularly vulnerable to climate change as precipitation is forecast to decrease and become more variable in California’s semi-arid bird habitats. A diverse collection of birds rely on the food and shelter provided year-round by estuarine and near-shore ocean habitats for survival (Page et al. 1992). Additionally, many migratory species require these habitats for seasonal foraging during migration. The persistence and/or quality of these habitats may be jeopardized by sea level rise (SLR). For example, intertidal mudflats and marshes, which are critical habitats for many bird species, will be affected by SLR. Scientists have not yet determined whether those habitats in the Coos estuary, whose elevations relative to tidal elevations are maintained by tidally-driven sediment inputs, will be able to keep pace with SLR. If not, those habitats may be significantly altered (“drowned”) by the higher tide levels associated with SLR. However, sedimentation rates may increase with SLR, which would allow mudflat and marsh elevations to remain constant relative to tidal flooding levels and would maintain viable estuarine bird habitat. Researchers suggest that SLR could change the character of intertidal bird habitats, because greater tidal ranges would cause increased salinity in brackish and freshwater habitats due to increased salt water inundation (Dalton et al. 2013; Glick et al. 2007). This transition may affect the distribution of birds who use these environments as foraging grounds, while forcing species who rely on less saline intertidal environments higher into the estuary (Dalton et al. 2013). The issues associated with SLR are exacerbated by continued development of coastal shore lands. Research has demonstrated that habitat disturbances from human activities and domestic pets can degrade bird habitat by reducing their foraging efficiency, disrupting opportunities to rest, and compromising breeding habitat (Lafferty 2001; Brown et al. 2000; Powell and Collier 2000). Reproduction and survivorship may be reduced if continued SLR pushes birds towards habitats where they would be increasingly subjected to chronic disturbances. Similarly, bird habitats may be jeopardized in areas where marshes border developed land, because humans are unlikely to allow intertidal habitats to migrate inland in response to SLR due to the high value of real estate near the existing high tide zone (Glick et al. 2007; Yamanaka et al. 2013). In addition to altering migration timing, birds appear to be expanding and contracting their ranges in response to climate change. For example, Parmesean and Yohe (2003) analyzed studies of over 1,700 birds species across the globe and discovered “significant range shifts averaging 6.1 km (3.8 miles) per decade towards the poles.” The Oregon Climate Change Research Institute (OCCRI 2010) suggests the same trend is happening in the Pacific Northwest, with local birds tending to shift their distributions northward as climate continues to change. Shifts in the geographic distribution of bird species are noteworthy because they essentially “reshuffle” natural communities, introducing birds to new prey species, predators, competitors, parasites, and diseases (Root and Hughes 2005 cited from WWF 2006, Rocke and Samuel 1999). In the project area uplands, the connection between climate-related range expansion and competition for resources is exemplified by the northern barred owl (Strix varia varia). Over the past 50 years, researchers have noted that the barred owl has expanded its range into southwestern Canada, the northern Rockies, and the Pacific Northwest, where it’s invaded the range of the northern spotted owl (Strix occidentalis caurina)(Courtney et al. 2004). The United States Fish and Wildlife Service (USFWS 2013) recognize resource competition from the barred owl as a potential threat to the spotted owl. Some surveys on the Oregon coast show that the spotted owl decline corresponds to concurrent increases in barred owl abundance, suggesting that this competitive threat may be substantial in the forests surrounding the project area (Forsman et al. 2013). Bird species that do not have the flexibility to expand their range (e.g., island and mountain birds) are particularly vulnerable, because even moderate climate-related changes may exceed their ability to adapt by shifting migration or population distribution patterns (WWF 2006). 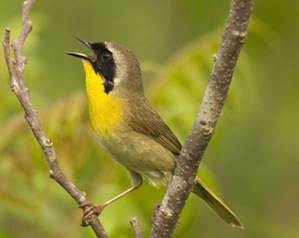 Local bird experts have noted an increase in the overwintering populations of several “neotropical migrant” species (common yellowthroats, orange-crowned warblers, and yellow-breasted chats). Neotropical migrants are birds that spend the summer in the northern temperate and polar latitudes and migrate south to the tropics where climate and food availability are more agreeable during winter months. This trend could be indicative of a general warming pattern in the temperate latitudes, although more data are needed to determine the exact correlation between climate change and neotropical migrant abundance. Becker, B. H., M. Z. Peery, and S. R. Beissinger. 2007. Ocean Climate and Prey Availability Affect the Trophic Level and Reproductive Success of the Marbled Murrelet, an Endangered Seabird. Marine Ecology Progress Series 329: 267-279. Bolger D. T., M. A. Patten, and D. C. Bostock. 2005. Avian reproductive failure in response to an extreme climatic event. Oecologia 142: 398- 406. Courtney, S. P., J. A. Blakesley, R. E. Bigley, M. L. Cody, J. P. Dumbacher, R. C. Fleischer, A. B. Franklin, J. F. Franklin, R. J. Gutiérrez, J. M. Marzluff, and L. Sztukowski. 2004. Scientific Evaluation of the Status of the Northern Spotted Owl. Sustainable Ecosystems Institute. Portland, OR. Dunn, P. 2004. Breeding dates and reproductive performance. Advances in Ecological Research 35: 69-87. Forcey, G. M., W. E. Thogmartin, G. M. Linz, W. J. Bleier, and P. C. McKann. 2011. Land use and climate influences on waterbirds in the Prairie Potholes. Journal of Biogeography 38: 1694-1707. Forsman, E. D., C. McCafferty, E. Divine, S. Kane, J. Mowdy, T. Plawman, A. Price, and M. Sullivan. 2013. Demographic Characteristics of Spotted Owls in the Oregon Coast Ranges, 1990-2012. [Wildlife Ecology Team: Wildlife Habitat Relationships in Washington and Oregon FY 2012]. Hussell, D. J. T. 2003. Climate change, spring temperatures and timing of breeding of tree swallows (Tachycineta bicolor) in southern Ontario. Auk 120: 607-618. Lafferty, K. D. 2001. Birds at a Southern California beach: seasonality, habitat use, and disturbance by human activity. Biodiversity and Conservation 10: 1949-1962. National Audubon Society (Audubon). 2014a. Audubon’s Birds and Climate Change Report: A Primer for Practitioners. National Audubon Society. New York. Contributors: Gary Langham, Justin Schuetz, Candan Soykan, Chad Wilsey, Tom Auer, Geoff LeBaron, Connie Sanchez, Trish Distler. Version 1.2. Oregon Climate Change Research Institute (OCCRI). 2010. Oregon Climate Assessment Report. K. D. Dello and P. W. Mote (eds). College of Oceanic and Atmospheric Sciences. Oregon State University. Corvallis, OR. Parmesan, C. and G. Yohe. 2003. A globally coherent fingerprint of climate change impacts across natural systems. Nature 421(6918): 37-42. Powell, A. N. and C. L. Collier. 2000. Habitat use and reproductive success of western snowy plovers at new nesting areas created for California least terns. Journal of Wildlife Management, 64(1): 24-33. Jamestown, ND: Northern Prairie Wildlife Research Center Online. http://www.jstor.org/stable/3802971?seq=1#page_scan_tab_contents. Rocke, T. E. and M. D. Samuel. 1999. Water and Sediment Characteristics Associated with Avian Botulism Outbreaks in Wetlands. The Journal of Wildlife Management 63: 1249-1260. Root, T. L., J. T. Price, K. R. Hall, S. H. Schneider, C. Rosenzweig, and J. A. Pounds. 2003. Fingerprints of global warming on wild animals and plants. Nature 421(6918): 57-60. Root T. L. and L. Hughes. 2005. Present and future phenological changes in wild plants and animals. In: Lovejoy T. E. and Hannah. L. (eds.). Climate Change and Biodiversity. New Haven and London: Yale University Press. 61 pp. Rosenzweig, C., G. Casassa, D. J. Karoly, A. Imeson, C. Liu, A. Menzel, S. Rawlins, T. L. Root, B. Seguin, and P. Tryjanowski. 2007. Assessment of observed changes and responses in natural and managed systems. In: M. L. Parry, O. F.
Canziani, J. P. Palutikof, P. J. van der Linden and C. E. Hanson (eds.). Climate Change 2007: Impacts, Adaptation and Vulnerability. Contribution of Working Group II to the Fourth Assessment Report of the Intergovernmental Panel on Climate Change. Cambridge: Cambridge University Press: 79-131. Sorenson, L. G., R. Goldberg, T. L. Root, and M. G. Anderson. 1998. Potential effects of global warming on waterfowl populations breeding in the northern Great Plains. Climatic Change 40(2): 343-369. Sydeman, W. J., K. L. Mills, J. A. Santora, S. A. Thompson, D. F. Bertram, K. H. Morgan, B. K. Wells, J. M. Hipfner, and S. G. Wolf. 2009. Seabirds and Climate in the California Current: A Synthesis of Change. California Cooperative Oceanic Fisheries Investigations Reports 50: 82-104. Wong, L., G. C. van Kooten, and J. A. Clarke. 2012. The Impact of Agriculture on Waterfowl Abundance: Evidence from Panel Data. Journal of Agricultural and Resource Economics 37(2): 231-334.